John Schnacke is a retired EPD officer with 34 years experience. He’s been involved with shooting sports for 57 years and uses his knowledge of firearms to improve the shooting experience of everyone at the range. He was the Training Unit Commander for EPD for over six years which included firearms training for the entire department. He was an NRA pistol and shotgun instructor, Glock armorer, Colt AR-15 armorer, and Remington 870 shotgun armorer. 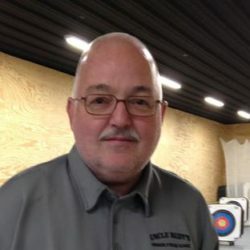 Now he uses his wealth of experience to train new shooters through individual instruction and small group classes at Uncle Rudy’s. Hobbies include camping, RVing, hiking, bicycling, and spending time with his wife and two schnauzers.